The baby's young unmarried mother - who hid her pregnancy from neighbours - raised the alarm after unexpectedly giving birth. 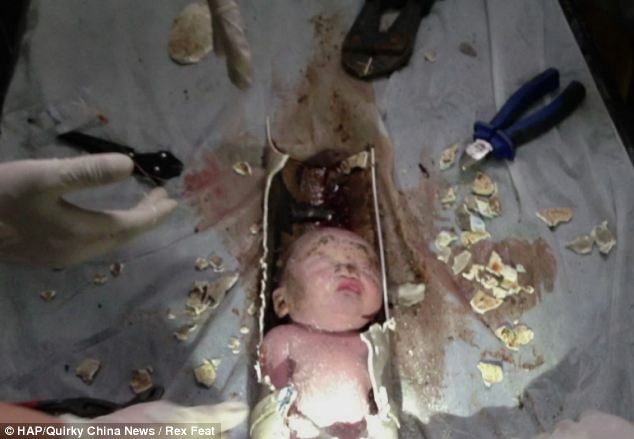 A newborn baby boy lodged in a sewage pipe directly beneath a toilet has been rescued by firefighters in eastern China. Suggestions that the child had been dumped have been revised after it emerged that the 22-year-old unmarried mother of the baby was the one who raised the alarm. According to a police source in Jinhua, in the eastern province of Zhejiang, the woman gave birth unexpectedly when she went to the lavatory on Saturday, and the newborn fell into the squat toilet. The mother, who had hidden her pregnancy, telephoned her landlord, claiming she heard "weird noises" in the pipe, and the proprietor called police after spotting the infant. Firefighters had to remove the pipe, reported to be 10cm (three inches) in diameter, and take it to a nearby hospital, where doctors carefully cut around it to rescue the baby inside. They spent nearly an hour taking the tube apart piece by piece with pliers and saws and finally recovered the 5lb (2.3kg) boy, whose placenta was still attached.